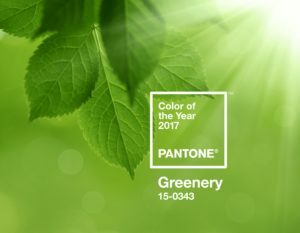 The announcement of the 2017 Colour of the Year by Pantone as being ‘Greenery’ 15-0343, is an exciting one. Here at Green Sprout Websites, we try to take our name literally, and embrace as much ‘green’ as possible. As a web designer from Adelaide, having grown up in the Adelaide hills, greenery, trees, spaces and grass are things that make my heart sing. The fresh new leaves on all the trees as you drive through the main street in Stirling at the beginning of spring is exactly the thing that came to my mind when I read about the Pantone Colour of the Year. So what does this colour mean? Is it just a colour that the fashion world, the interior design magazines and the Pinterest and Instagram bloggers will be using? Or is it indicative of something bigger? Typically these announcements from Pantone have a great influence on fashion trends for the year ahead, however, this year, the influence may go much deeper. Maybe it’s an idealistic dream for the future, maybe it’s an effort to help the world through these divided political and social times. In these times of worsening pollution, rising sea levels, and deforestation, the announcement of the colour Greenery signals a kind of hope for the future. Greenery in nature signifies new life, fresh beginnings, and rejuvenation. The colour green brings to mind: environmental, sustainable, natural, healthy, fresh, and revitalised. Greenery as a colour is not just any old green. It is a combination of cool blue and warm yellow and is vastly different to the colour of 2013, Emerald Green that embodied a certain luxury. This Greenery is all about minimalism. It brings to mind all of the ‘re’ words: rejuvenate, replenish, and recycle. It is a promise of new beginnings and fresh starts. All over social media the Green trend is growing. From meatless Mondays, green smoothies, green plant walls on inner city developments, community gardens, environmental movements, and sustainable practices. Greenery is the embodiment of all of these idealistic trends that are moving more and more to the mainstream. What does this mean for business and website design? I think there is a need for simplicity, and pared back design that speaks of uncluttered, un-rushed information. We are all still busy, so lets make the information we are seeking available and findable. Lets design our websites so that people feel relaxed when they land on your webpage, they feel calm because they can easily see the information they came looking for, or they feel relieved because they are offered a solution to a problem before they even realised that problem was there. Lets design your website with all of this in mind. As I set my goals for the year ahead, and think about where I want myself and my business to be, this time next month, next quarter, next year, I am thinking about this colour and how I can incorporate it and its principles in my life. A new plant in the office? Expand my walking trails with our dog to explore some new areas? There are lots of ways to get more connected with our community, and nature, and feel re-energised as we move into this new year. Have you set your business goals for 2017? Does your office need a new plant? Or does your website need an overhaul? Could it be fresher updated, and re-energised. Are your customers seeing the best version of your business when they search online? Now is the perfect time to book a free session with us to discuss your website design and how we can help to bring those goals into reality. How we can re-fresh your look and bring a little bit of Greenery into your world.